Mario Azzopardi won the lifetime achievement award for contribution to Maltese literature during the National Book Prize ceremony held last night. 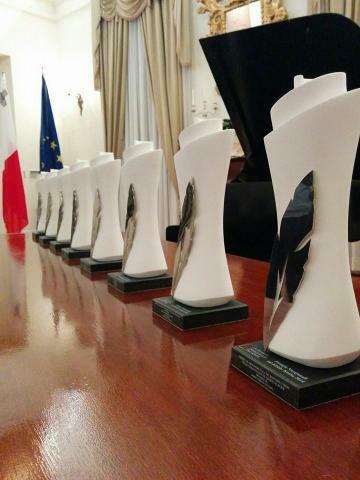 The official prize-giving ceremony took place at Auberge de Castille during which winners in every category recieved a trophy, certificate and a €1,000 prize while certificates were handed out to all shortlisted authors and their publishers. The adjudication board for this year’s edition of the National Book Prize was composed of Prof. Clare Vassallo, Mr Mario Ellul, Prof. Victor Mallia Milanes, Mr Andre Vella Laurenti, Mr Caldon Mercieca, Dr Josette Attard, Ms Justin Somerville, Ms Kristy Borg and Ms Ruth Ancilleri. Ms Cheryl Falzon and Ms Joanne Sciberras evaluated the books in their respective categories.